Engadget is reporting that Asustek (who currently produces the 12″ iBook and 12″ Powerbook is going to be producing a new 14″ widescreen iBook. 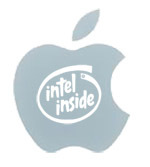 Speculation abounds whether this will be Apple’s foray into Intel powered hardware, or one of the last laptops built for the PowerPC line of processors. Either way, this model will surely hold a special place in at least half of the community’s heart (depending on what side of the fence you’re on regarding the hardware change). Regardless of that, I’m wondering if the new aspect ratio is going to carry with it a higher resolution display. My Powerbook’s DPI is looking pretty dinky next to the new Sony screens!